RealChoice: Does Planned Parenthood Harvest Fetal Parts via "Partial Birth Abortion?" IMPORTANT UPDATE: After reviewing the unedited video, I have concluded that the short video being circulated is very misleading. I am allowing this post, which I wrote many hours before reviewing the unedited video, stand because I think it's important to see how the edited video steered me to a very wrong conclusion. 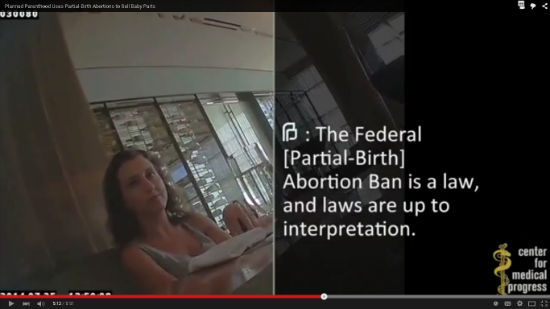 I do not think that the unedited video shows a willingness on Dr. Nucatola's part to violate the federal Partial Birth Abortion ban in order to procure fetal heads. In fact, the use of the first person is a case of her saying what another doctor might say to himself or herself when calculating whether or not what they do is or isn't a violation of the PBA ban. It in no way reflects on how she herself performs abortions. 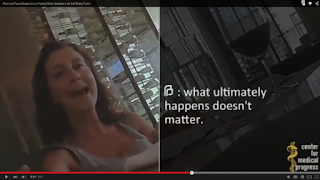 In a previous post, I verified that the woman in the Planned Parenthood Sells Baby Parts video is indeed Dr. Deborah Nucatola, and that she is indeed the Director of Medical Services for Planned Parenthood Federation of America. I then verified that the online order form for various fetal parts is real. Now I'm going to check out the title of the video: "Planned Parenthood Uses Partial-Birth Abortions to Sell Baby Parts." Here is the video. The section addressing the alleged use of the abortion method called "Partial Birth Abortion" or "PBA" by prolifers and called "Dilation and Extraction," "D&X," or "Intact Extraction" by abortion-rights advocates begins at around 3:54, when Dr. Nucatola starts to discuss orders for the calvarium, which is basically the head of the baby. She describes how the abortion practitioner will turn the fetus so that it is not presenting head-first because when the procedure is started, the cervix is usually not yet dilated enough to allow the head to come out whole. But if the practitioner turns the baby and pulls it out feet-first, this further dilates the cervix, allowing the head to be taken out undamaged. The Center for Medical Progress notes next on the video that this turning of the fetus to a feet-first presentation and pulling it out is the same method used in the D&X/PBA abortion technique. This abortion method has been banned in the US. However, if the fetus is killed before the practitioner begins to pull it out of the womb, the procedure is not the banned procedure called "Partial Birth Abortion." 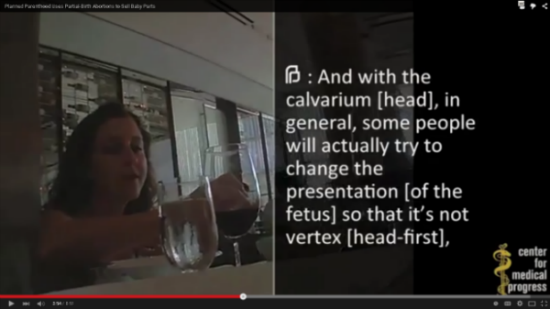 For the claim that Planned Parenthood practitioners are using the banned method in order to get an intact fetal head for sale entirely hinges on whether the baby is killed before or during the abortion. Well, Dr. Nucatola addresses this. She states that the ban is a law and as such is "up to interpretation." She indicates that the way around the law is to "say on Day 1, I did not intend to do this so what ultimately happens doesn't matter." This does not sound as if the fetus is being killed prior to beginning the procedure in order to perform a legal extraction rather than an illegal "Partial Birth Abortion." Let's face it, neither of those two methods would be particularly useful if the goal is to harvest as many marketable specimens as possible. There are three methods of killing the fetus prior to starting an extraction would render the fetus less desirable for harvesting marketable specimens. Lethal injection into the heart, the most common method of "inducing fetal demise", would damage the heart, which is an organ that is in high demand. Lethal injection into the brain, a less common method, would damage the very head that the buyer wants to purchase. Lethal injection into the amniotic fluid (which is rarely used any more) would damage the entire fetus and render all of the tissues unsuitable for sale. It also does not sound as if they are putting the fetus into a breach position to do a standard dismemberment method, because she is speaking of interpretation of the ban on intact extraction, not avoiding intact extraction altogether. If there were no risk of breaking the law because fetal demise was achieved before beginning the abortion, or because fatal dismemberment would be completed before the head was ready to be extracted, surely she wouldn't have felt the need to explain how they "interpret" the PBA ban. 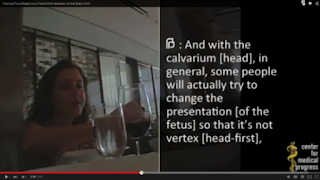 The only reasonable interpretation of what Dr. Nucatola is saying is that if there is an order in place for an intact fetal head, the approach is to mark the chart as if a dismemberment abortion is intended, then just claim afterward that the fetus accidentally came out in one piece. This would provide an entire fetus full of undamaged specimens to harvest rather than a fetus with only a few salvageable parts. Though the Center for Medical Progress notes the Born-Alive Infants Protection Act, Dr. Nucatola does not Perhaps this is a can of worms she prefers not to open. It's remarkable enough that she admitted that they, ahem, "interpret" the Partial-Birth Abortion ban. Which certainly sounds as if they are indeed "accidentally" using it in order to get nice, sound whole fetal heads for sale. Everything Dr. Nucatola says supports the Center for Medical Progress's claim that Planned Parenthood uses the banned D&X procedure to get fetal heads for sale. One might nit-pick and say that PP only uses the PBA to get fetal heads, not other fetal parts, and therefore the headline is misleading, but that would be a clear act of desperation. One Illegal, One Legal, What's the Difference?